The 19-year-old Arizona wing, who is still testing the waters', helped himself on day one by getting to the rim at will thanks to his 223-pound frame and showing a level of assertiveness that most players here lacked. Alkins, who shot 37% from three as a freshmen, also knocked down two spot threes and showed he's a capable pick and roll ball handler given his solid vision. The Brooklyn native also competed defensively, an area where he greatly improved during his time under Sean Miller at Arizona. Alkins still has work to do to solidify his draft stock, but his day one performance will undoubtedly help his cause. 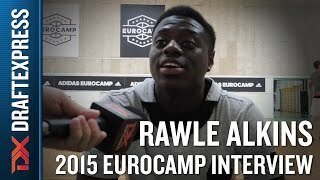 A video interview with elite high school wing Rawle Alkins at the Under Armour Elite 24. Despite scoring only 4 points on 2/10 shooting on day two, Rawle Alkins bounced back to score 11 points on day three while going 5/9 from the field. Generating as much buzz among NBA scouts as any player on the US Select Team, Alkins impressed throughout his three days here with his approach to the game. At 6'4 with a 200+ pound frame, he enjoys a considerable strength advantage over essentially any player he suits up against his age, but he doesn't rest on his laurels competing as hard as anyone here. Taking this setting very seriously, Alkins impressed on the offensive end with his ability to finish at the rim, create off the bounce, and move the ball to keep the offense flowing. He has a low, but consistent release point that allows him to knock down perimeter shots at a nice rate, and while he could stand to improve his ball handling ability, has a nice package of offensive tools. Perhaps more importantly, Alkins is a terrific defender, using his strength and lateral quickness to hound ball handlers, crashing the glass at a terrific rate for a guard, and even providing some rim protection over his time here thanks to his terrific leaping ability. All-in-all, Alkins was arguably the most consistently impressive player we saw in Treviso. One of the main attractions of this year's Eurocamp is the high level talent assembled on the adidas USA select team roster. Featuring an assortment of top-40 players from the class of 2016, the event organizers hit a home run this season bringing in an even better roster than the inaugural group from last year, which included the likes of Thon Maker and Brandon Ingram. The 2014 US select team went 0-3 losing by an average of 25.9 points. The 2015 scored a 76-71 victory over the French U20 National Team in the second game of the day. Though the USA Select team got contributions from a number of players, it was New York's Rawle Alkins who had the strongest showing today, as he poured in 18 points in 25 minutes while going 7/8 from the floor. A powerfully built 6'4 shooting guard with terrific athleticism hailing from Christ the King Regional HS in New York, Alkins showed why he's one of the top scorers in the adidas Gauntlet where he averages 24.3 points per game for the NY Rens. Possessing terrific strength for a 17 year old, Alkins did an impressive job creating opportunities for himself by being aggressive attacking the basket. Converting a number of very athletic finishes to go along with a couple of makes from beyond the arc, his efficient scoring was a big reason the US Select Team was able to get the best of an older, more experienced French squad. On top of his scoring, Alkins came up with a number of rebounds (5), along with a handful of assists, and did a nice job defensively. Using his quickness to pressure the ball and contesting a number of shots effectively with his leaping ability, Alkins stood out today, despite being one of the younger players on the floor.